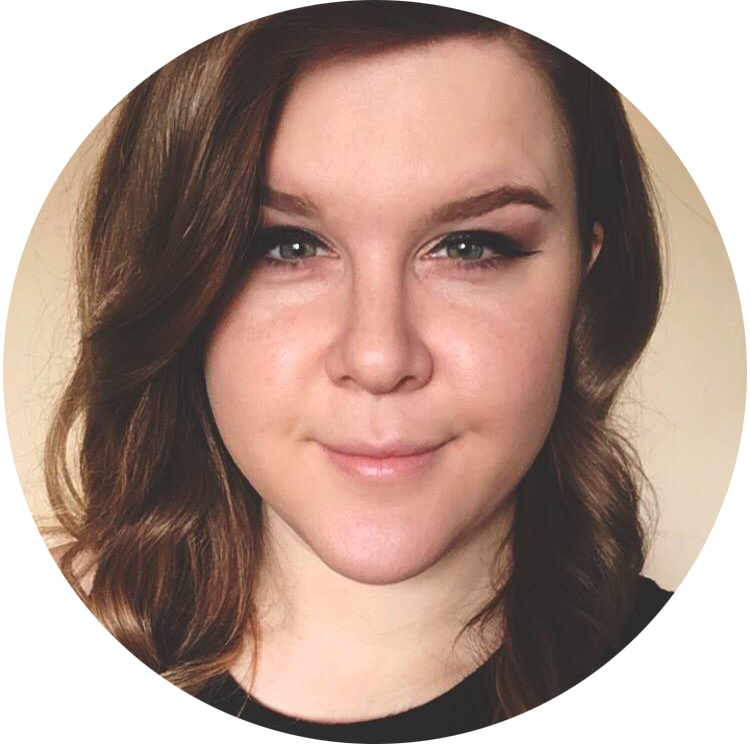 I've been promising this post since Friday... and finally, here it is! Adventure Time is one of my favorite cartoons ever. I think the humor in it is so weirdly fantastic, and the characters are so entertaining. What better way to honor one of my favorite shows than with one of my favorite activities -- doing nail art! 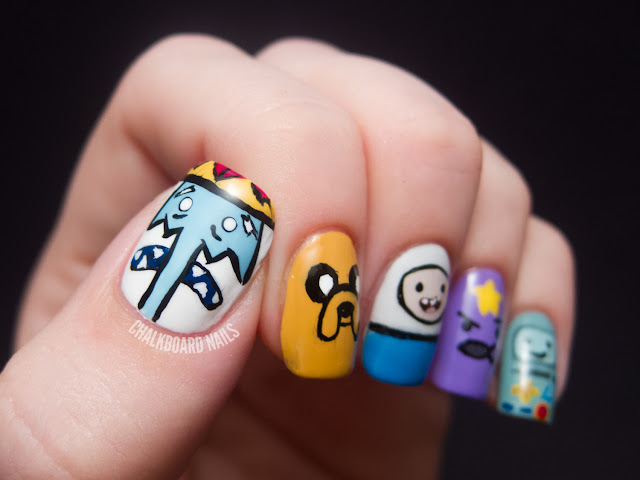 I know I'm not the first person to do Adventure Time nail art, and that's okay! I absolutely loved the way that these nails turned out. On my thumb you can see the Ice King, followed by Jake the Dog, Finn the Human, Lumpy Space Princess (my personal favorite), and Beemo. I think the Ice King turned out the best, but his face is also inherently more detailed than the other characters, and therefore it had more visual impact. I used a load of colors for these nails. I'll go over some of the highlights, but I won't be getting into every color! The Ice King's skin was done with OPI What's With the Cattitude?, his dark blue mouth was done with China Glaze Man Hunt. The crown color was a mix of a few colors as I was trying to get the right shade. Jake's color was hand mixed using China Glaze Desert Sun and China Glaze Happy Go Lucky. Finn's skin color is Zoya Kennedy blended with some white. His shirt color is Orly Skinny Dip. LSP's base color is piCture pOlish Wisteria. I honestly could not have asked for a better color for her. Beemo's color was made by mixing OPI WWTC? and OPI Mermaid's Tears. I ended up being awake way later than I should have been (on a work night) because I was finishing these nails, and it was absolutely 100 percent worth it! ive been wanting to do adventure time nails for awhile but am just kind of daunted by the task. these are freaking awesome and the fact that you got bmo in there is the best of all. This is beyond amazing, when I saw this I almost peed myself! You've got some serious nail-art talent, this is so good! I LOVE THIS. The little Beemo is my favorite!!! Haha these are awesome. I love the ice king, his facial expression is perfection! This is sooo cool! Adventure Time is one of the better new cartoon shows. so fuuuunny ! i'm in love wth your middle finger!! This is soooo math!! LOVE it so much! They are PERFECT! 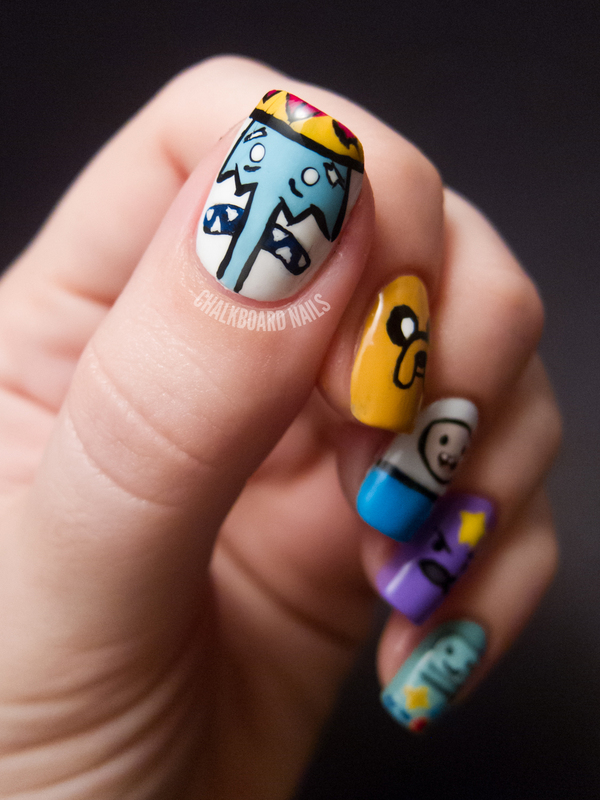 These nails are algebraic! Holy crap, I love these. I love Adventure Time! LSP looks like she's going, "What the lump?" haha. These are perfect. WOW!! The Ice King is AWESOME!!! my favorite nails so far! Adventure time is such a stupid show! But the nails turned out perfect! 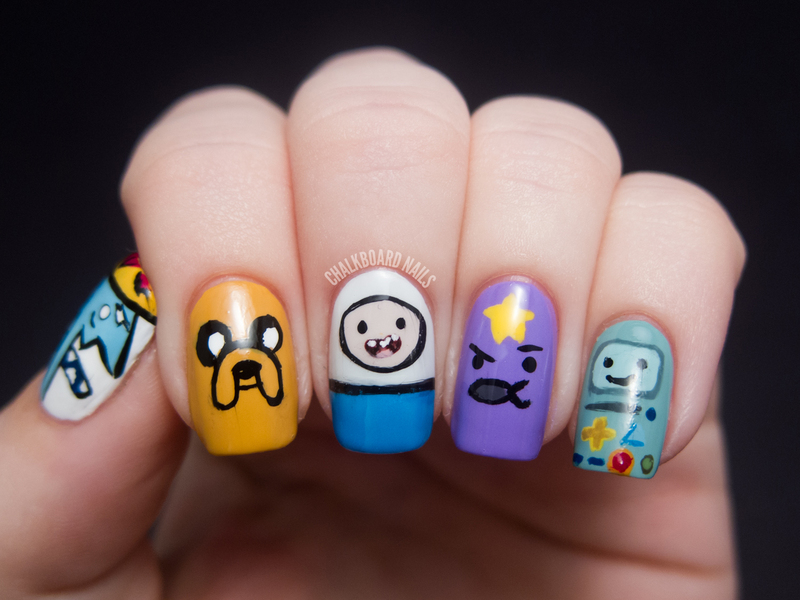 Oh my Glob, these are awesoooooooome! These are definitely on my to-do list. My daughter nearly wet herself when she saw theses!!! 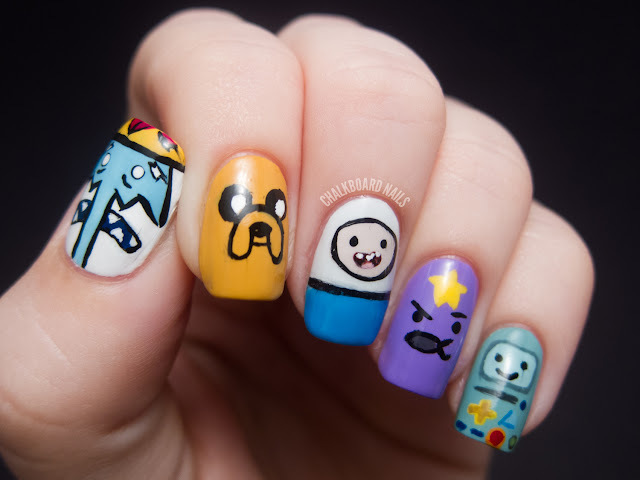 then she says to me..mum why didnt you paint my nails like that when i asked for adventure time? i then had to explain to her that she only has tiny nails and it would have been too hard for me to do it!!! but here is a link on what i did do! lol so awesome! These look incredible! These are so MATH!!!! I absolutely love Adventure Time!!!! This made my heart skip a beat!!! Oh they are so funny! Love 'm. Wow, your nails look fab, love 'em. Great job Sarah! I love Adventure Time, especially LSP. I looooooove this! Adventure Time is awesome! Omg! You go girl! I wish I had the right colors. Darn, oh well.... Guess ill try my best!!! You Have DEFINITLY got talent girl. Go You! Wow. This ish is Wicked as Hell!!! I am stunned! LSP is my fav cartoon character...Eeerrmmmeeggerrdd!!! I LOVE THIS MANICURE!!! UP TOP! OH MY GLOB!! those are amazing, i'll try to do them but, i will have an epic fail. :D !! Is it possible for you to make these on fake nails and i can pay you for them?????? honestly these are amazing!!!!!!!!!!!!!!!!!!!!!!!!!!!!!!!!!!! Can u please make these on false nails so I can purchase them I just can't get them to look right. Haha too funny! Didn't even think of that.